All the work this week has been in the kitchen as we push to finish our Island House project. Doors Galore and Siding No More! The Island House has many hand made doors, including this one for the garage side entrance. Hand built carriage house doors with steel strap hinges. First floor & garage siding - done! 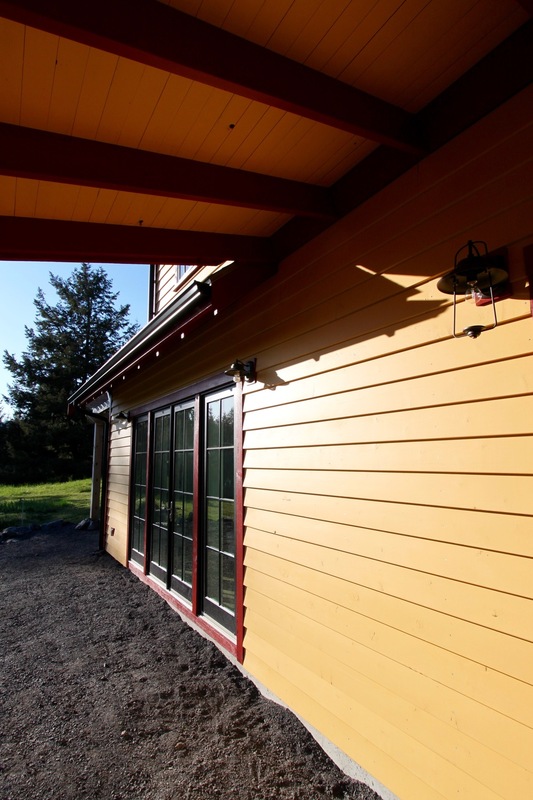 Brightly painted cedar bevel siding. This week we finished siding all the lower walls of the house, so that only the upper gable end walls are left to do. It looks wonderful! We got our corners perfectly lined up despite not using (or having) a transit for the work, something that makes us feel good. We also finished siding the garage gable ends. That job took a considerable amount of time to accomplish and wasn’t without frustration. But get it done we did, and it’s splendid to come up the driveway and see the work completed. We did some odd jobs around the house (caulking, touch up painting and installing door handles) on Friday while waiting for friends to arrive. Last summer we built these colorful carriage doors for our garage and this week we finally installed them! We wound up the week with hanging the garage doors, at very long last. Some of you may remember that we built the doors in July. They are now hanging and looking splendid! Still need to put another door handle on and add some barrel bolts to the inside (cane bolts secure the doors at the base) and do the trim caulk and painting, but they are installed and now the carriage house effect is complete. For the coming week we hope to check some more things off our list…those things will hopefully include installing the side garage door, continuing with kitchen cabinet work and finishing the priming and painting of the last three bundles of siding. Perhaps we’ll even get to begin the upper gable ends of the house. Time will tell!